About 2 of every 3 people will need some level of long-term care in their lifetime, some will age in place to the extent possible, and others will move to transitional environments for seniors for a variety of reasons. These reasons may include the loss of a spouse, or a health related issue that prevents them from living independently any longer. And, for some families of older adults they will find themselves in a position of crisis; downsizing due to a medical recommendation, with no time to leisurely move their loved one with grace and planning. Soft Landing Transitions is focused on the older adult’s needs to help facilitate a move with moving company coordination, estate sale representatives, charitable donation organizations and more. During the move process, the client and their adult children/grandchildren and senior living staff are informed as to the status of the move. For some older adults, downsizing and reorganizing is necessary to make pathways clear and food shelves accessible. For others, a medical diagnosis prevents the older adult from returning home and the Senior Move Manager organizes the home for resale as the family attends to their loved one. They often realize that they cannot make all the necessary preparations by themselves in a cost effective manner. Senior transitional moving is stressful and overwhelming for many, often not choosing to move and leave behind 20 years or more of their possessions. Parting with their belongings is emotional and children are not able to acquire their possessions due to lack of space, distance or lack of interest. Senior Move Managers bring relief, calm, and confidence to the family and promote their client’s dignity and autonomy. Often, families that live out of state that may end up using vacation time to care for their loved one with the added responsibility of looking after their former place of resident and belongings from a distance. Soft Landing Transitions has expertise in resources and approaches that save money, reduce stress and lead to a positive outcome. 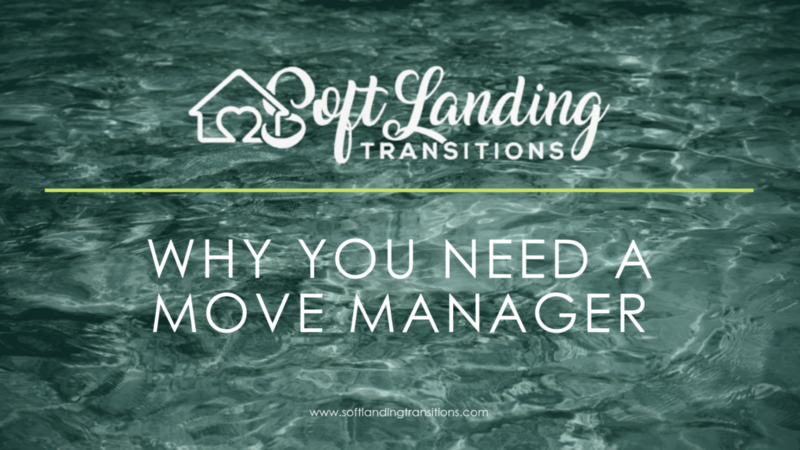 Whether the older adult and their spouse is considering downsizing, aging in place, or moving to a senior facility, Soft Landing Transitions offers a variety of solutions specifically tailored to the needs of each client and their families. Give us a call to set up your Complimentary Initial Consultation today.